Go to Reports > Transaction & Activity. In the Search Transaction & Activity Records section, select “Full Name,” “First Name,” “Last Name,” or “Email” from the dropdown menu. Type the name or email address of the supporter in the Search bar to find the transaction, then click Search. Scroll down to the list of transaction results. Click on Details to the right of the desired transaction. 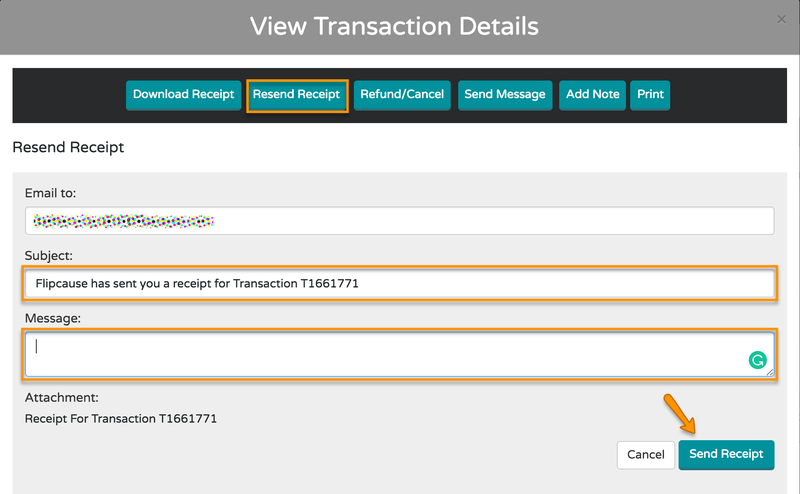 Select Resend Receipt at the top of the View Transaction Details window. You can customize the subject and the body of the message that will be sent to the supporter. Then click Send Receipt.